The Virgo cluster is a massive cluster of galaxies which dominates the Virgo supercluster. There are roughly 2000 galaxies in this cluster (although ninety percent of them are dwarf galaxies). This cluster has a diameter of approximately 15 million light years which is not much larger than our Local Group but it contains fifty times the number of galaxies. This map shows 600 of the brightest galaxies within 7.5 degrees of the centre of the cluster - this is an arbitary border, there are many other galaxies beyond this limit especially to the south of the cluster where there are several additional galaxy groups. The 160 largest galaxies are labelled on this map. There is also a negative version of this map which may be easier to print. Below - nine galaxies on the right side of the Virgo cluster. 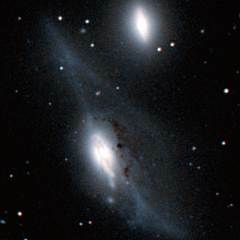 M98 (top-left) and NGC 4216 (top-centre) are two similar spiral galaxies seen from the same angle. 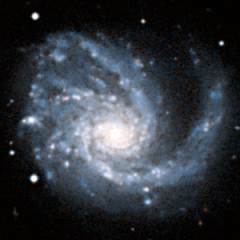 M99 (top-right) is a very lop-sided spiral galaxy. 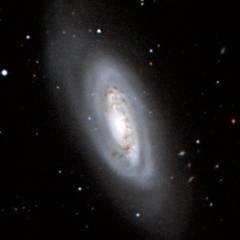 NGC 4293 (middle-left) is a spiral galaxy near the top of the Virgo cluster. 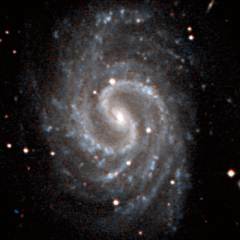 M100 (middle-centre) is one of the most famous spiral galaxies in the sky. 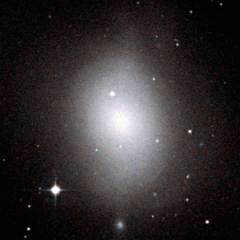 NGC 4365 (middle-right) is a large elliptical galaxy near the bottom of the Virgo cluster. M84 (bottom-left) is a large elliptical galaxy near the centre of the Virgo cluster. 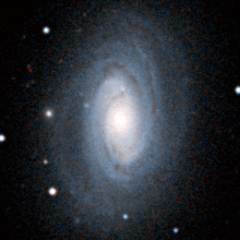 M85 (bottom-centre) is a large lenticular galaxy further north. 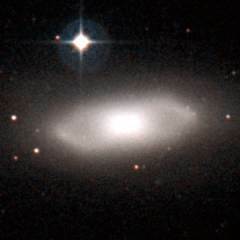 This galaxy shows some shell-like structure probably because it has swallowed a spiral galaxy in the past few hundred million years. M86 (bottom-right) is one of the largest elliptical galaxies in the Virgo cluster. 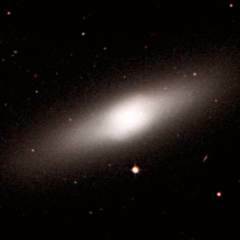 It has a bright core surrounded by a faint but extensive halo of stars. This is a list of the 160 largest galaxies in the Virgo cluster - this is every galaxy labelled on the above map. 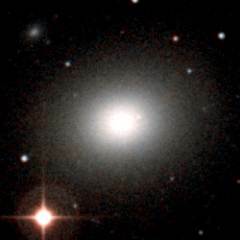 This list is every galaxy with an angular size greater than 1.8 arcminutes within 7.5 degrees of the centre of the cluster which at a distance of 52 million light years corresponds to every galaxy with a diameter greater than 30 thousand light years within 7 million light years from the centre. 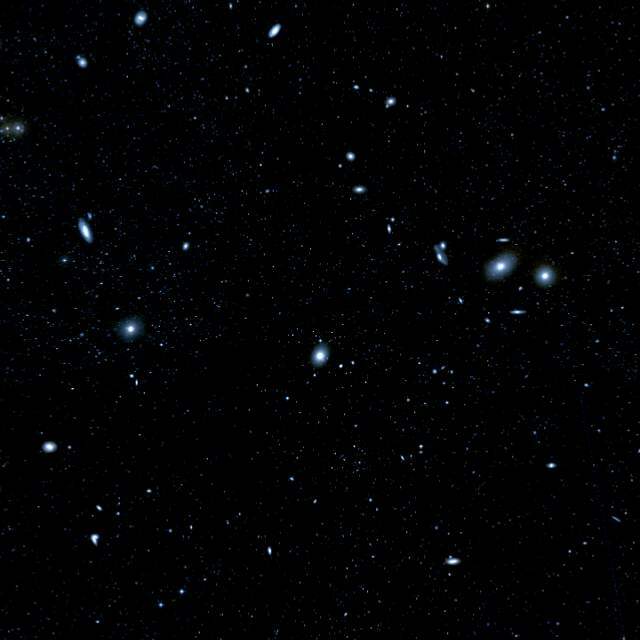 Some of these galaxies may be foreground or background galaxies in the vicinity of the cluster. Below - another nine galaxies in the Virgo cluster. NGC 4429 (top-left) is a fine example of a lenticular galaxy showing a central bulge surrounded by a disk of stars. 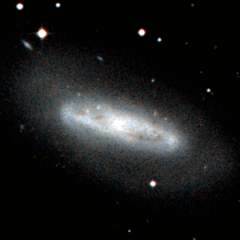 NGC 4438 (top-centre) is a spiral galaxy near the centre of the Virgo cluster which has become disrupted by a close encounter with the lenticular galaxy NGC 4435 above it. 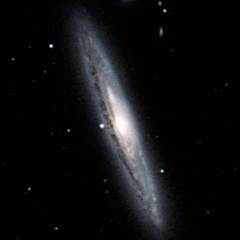 NGC 4450 (top-right) is a spiral galaxy with smooth spiral arms. NGC 4459 (middle-left) is a lenticular galaxy seen almost face-on. 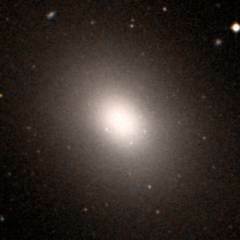 M49 (middle-centre) is an elliptical galaxy and it is the largest galaxy in the southern half of the cluster. 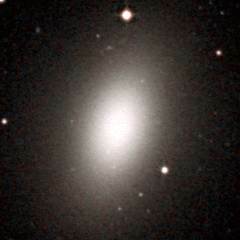 NGC 4473 (middle-right) is an elliptical galaxy with a very oval shape. M87 (bottom-left) is the very large and active galaxy at the centre of the Virgo cluster. M88 (bottom-centre) is another nice spiral galaxy. 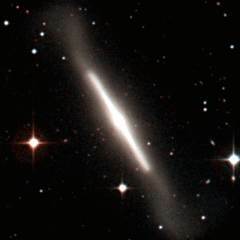 NGC 4526 (bottom-right) is a superb example of a lenticular galaxy. It is not possible to get a good photograph of the entire Virgo cluster because the galaxies are rather faint and small objects scattered across 15 degrees of the sky. Below is photograph of the centre of the cluster showing the inner 4°x4° region. Most of the brightest objects in this picture are galaxies. 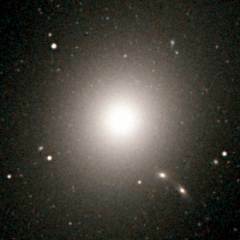 The elliptical galaxy in the centre is M87. 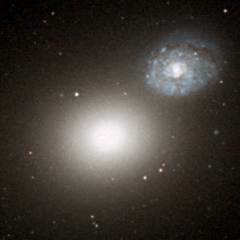 The two largest galaxies on the right are the large elliptical galaxies - M84 and M86. 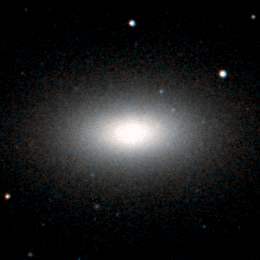 The three largest galaxies on the left are M89, M90 and M58. 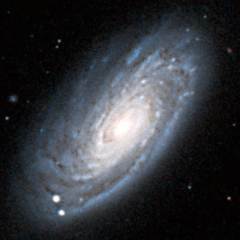 At the top edge of the picture are the two large spiral galaxies M88 and M91. The middle of the Virgo cluster. Image size 4°x4°. 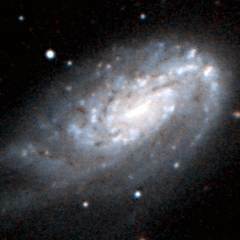 DSS image. Below - nine galaxies on the left side of the Virgo cluster. 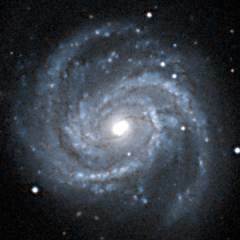 NGC 4535 (top-left) and M91 (top-centre) are two fine examples of barred spiral galaxies. 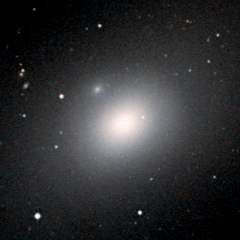 M89 (top-right) is another of the large elliptical galaxies near the centre of the Virgo cluster. 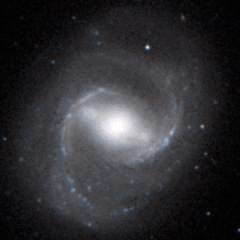 M90 (middle-left) and M58 (middle-centre) are two similar spiral galaxies. 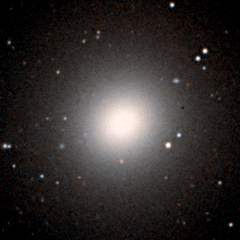 M59 (middle-right) is a large elliptical galaxy on the left side of the Virgo cluster. 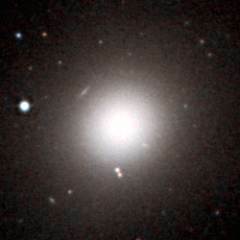 M60 (bottom-left) is another elliptical galaxy on the left side of the cluster. 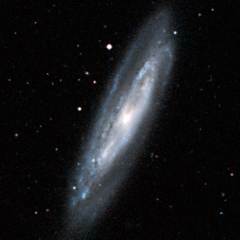 In the same field of view is NGC 4647 - a spiral galaxy at a different distance. 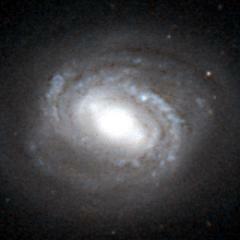 NGC 4654 (bottom-centre) is another spiral galaxy. NGC 4762 (bottom-right) is a bright lenticular galaxy viewed edge-on. 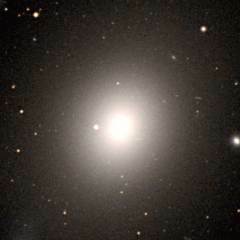 In the middle of the Virgo cluster is the large elliptical galaxy M87. This picture is the view of the galaxy from the Hubble Space Telescope. 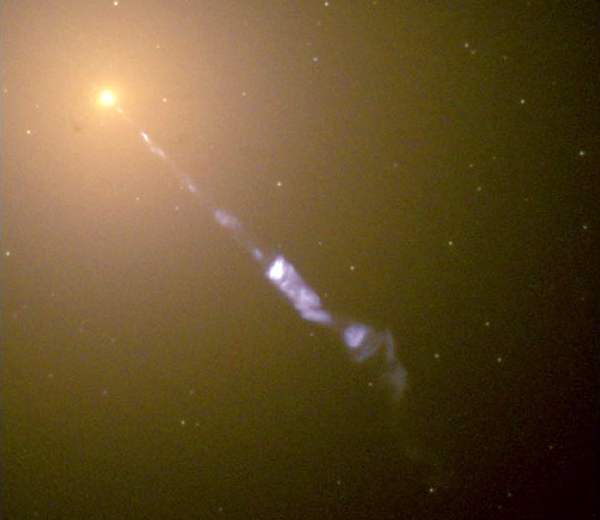 It shows an extraordinary jet streaming from the centre of the galaxy. This jet is more than 5000 light years long (or approximately 4 million times the diameter of our solar system). The jet consists of electrons and other sub-atomic particles which are being propelled outwards by a supermassive black hole at the centre of the galaxy. The black hole has a mass of about 2 billion solar masses, and as matter falls into the black hole it is concentrated by the intense magnetic fields around the black hole and some of it is propelled outwards to form the jet. The bright yellow glow of this galaxy is the combined light from the trillion or more stars in this galaxy. The points of light which can be seen in this image are a few of the fifteen thousand globular star clusters which belong to the galaxy.